Thomas Rowleys Origins - Extracts from "A Cameo of Thomas Rowley"
1.03 Whereas Brian Fletcher in his entry in the Australian Dictionary of Biography gives Rowley's birth-date as “1748?” - John Ritchie in the index to The Evidence to the Bigge Reports repeats this - Huntington says “he was born in the year 1753” and this is implied on his tombstone, erected in 1884, when the remains were re-interred. Another report sets his birth-date as 1756. Again, whereas Huntington suggests that Rowley “was much better educated than his brother officers in the Colony”, Fletcher makes the point that the “singularly poor grammar and spelling in his letters indicate that he could not have been well educated." 1.035 John Gray, a descendant who has done a considerable amount of research, suggests that Captain Rowley may be identical with the "Thomas Rowley", the son of George Rowley and Elizabeth (nee Friend) who was baptised at Kingston Upon Thames on 24 January, 1747 and I believe that this is likely. Rowley called his first farm "Kingston Farm" - to honour his birthplace ? - and his second, "Burwood Farm". Less than ten kilometres from Kingston Upon Thames are the villages Burgh Heath and Kingswood. Today, "Burwood Park" in England is operated by the Burbill Estates Co Ltd, no doubt Burbill being a similar contraction of Burgh Heath and Walton On The Hill. Further support for John Gray's suggestion comes from the close proximity of the village of Croydon, from which Major Grose came, and the knowledge that the appointment of the Adjutant was in the personal right of Grose. The following tree was compiled by John Gray. at Kingston at Kingston at Kingston . 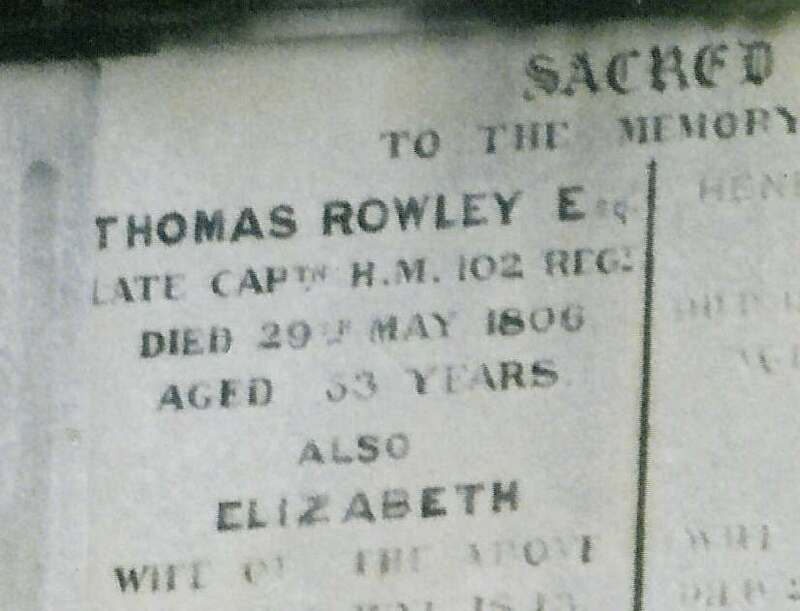 1.065 There is a record in the register of St Philip's of the burial on 20 September, 1822, of Thomas Rowley, aged 39 years, a corporal in the Marines. Ian Ramage mentions Burwood Park(1.035 above), but the mention of a composite name from Burgh Heath and Kingswood distracted me. Geoff Rowley pointed out Burwood Park is a real possibility. Francis Grose was probably born in Wandsworth, and his father was paymaster of the Hampshire Militia and later captain and paymaster of the Surrey Militia. Francis was living in Croydon Surrey in 1814 (ADB). - about 12 miles from Kingston, ie not that close in Greater London. terms. But maybe close enough if you are wealthy. Thomas may well have got his Adjutant job on a recommendation from Francis' father. Conclusion: Given the mobility of Francis and possibly Thomas, there is nothing to strongly support particular theories of Thomas' origin. 1762 Rowley Thomas, son of George, Kingston, Surrey, farmer, to John Dobbs, 7 Dec 1762, Innholders' Company. Rhonda : I believe it would have been the usual for George Rowley to have needed connections or money to get Thomas apprenticed. Early researchers placed Rowley's birthplace, or at least the place where he spent his childhood, as at a "Burwood Farm", said to be in Cornwall. Many people over the years have spent much time and energy in trying to locate a Burwood Farm in Cornwall, or verify the suggested connection with the prominent Rowley Naval families, both without success. In recent years my research suggests that he may have been born at Kingston-upon-Thames in Surrey.......... there is an old established property, Burwood Park, only a few miles from Kingston-upon-Thames in Surrey. There appears to be some connection with a Thomas Rowley, of Bath, and his nephew Joshua Rowley, and the sale of a portion of land, adjoining Burwood Park in 1769 to a Mr. Frederick (whose family held Burwood Park for several generations). Thomas Rowley's first appointment, to the New South Wales Corps, was as Adjutant in 1789. This rank is a Regimental appointment, rather than an Army appointment, and was most probably made by the first Commandment, Major Grose. Thomas Rowley was shown as "gentleman" on his appointment, indicating that he had not been in the Armed Services before. Major Grose was born at Petersham, Surrey and lived in Croydon, Surrey, both not far from Kingston-upon-Thames. His grants in New South Wales he called Petersham and Croydon. It is quite likely that Major Grose and Thomas Rowley were close friends, because they appear to have lived fairly close together in Surrey, and because it appears that Major Grose secured for him his appointment as Adjutant, an act which appears to have been within his power to implement. This close friendship could account for his appointment as Adjutant at 42 years of age when, I understand, nobody over 39 years was to be appointed to the Corps for service in New South Wales. Searching the LDS around 1753, the date where his tombstone points gives 44 hits in the period 1751-5, of which 11 appear to be duplicates. Hard work could eliminate many of these, but it is a reminder to be wary. We can rule these out if we are lucky, by finding children born in England after the Pitt departure, or if we are very lucky, a record of death or census entry in 1841. But these would not necessarily need to be near Kingston. See 1.03 above, and photo of the tombstone. Detail of inscription. (supplied by Glenn Rowley) This seems to give age 53 years, giving a calculated DOB between May 1852 and May 1853. This is not consistent with the son of George and Elizabeth who was christened in 24 Jan 1747. George and Elizabeth christened their Thomas at Kingston, and he called his first farm "Kingston Farm". Inconclusive. If you had to pick, you might go for Elizabeth Eyre. but Saint Margaret Lothbury is 1.2 miles N of the centre of London, ie not that close to Kingston. My hunch is he married not long before departure.As I say above, more work is needed on children and deaths..My Elizabeth Eyre is ratng about 25%. Circumstantial but strong evidence our Thomas was born in Kingston. But his date of birth is a lingering doubt that he is the son of George and Elizabeth..
A Cameo of Captain Thomas Rowley – Ian Ramage. 200pps on Thomas and his descendants.